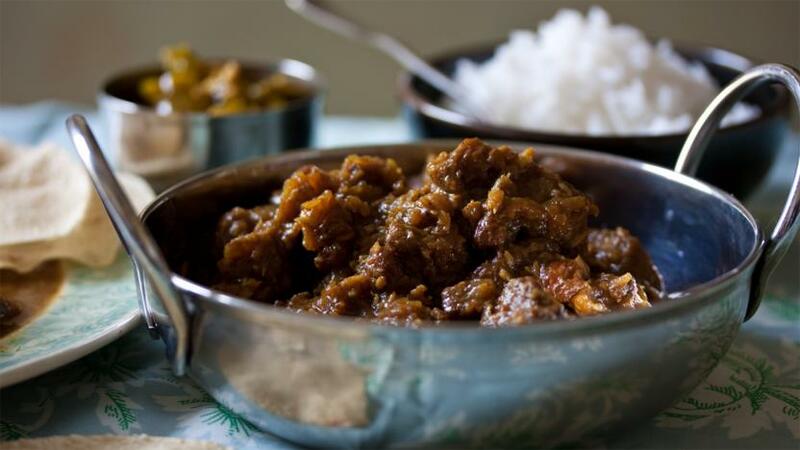 This beef curry is a version of a childhood memory of one of Rick Stein’s mum’s curries. The curry is finished with sultanas and desiccated coconut. Serve with chutney, salted fish and poppadoms. Melt the butter in a large, sturdy pan over a medium heat. Add the steak, in batches, and fry for a few minutes until browned and then remove to a plate. Add the onions to the same pan and fry for 10 minutes, or until softened and golden-brown. Add the garlic and fry for one minute, then return the meat to the pan, along with any juices on the plate. Stir in the chilli powder, turmeric, one tablespoon of the garam masala, and the salt, and cook for one minute. Add the stock, followed by the coconut and sultanas. Bring to a simmer, cover and cook over a low heat for 45 minutes to an hour or until the beef is tender. Stir in the remaining garam masala and serve.